In the struggle against the disintegrating insurgent movement, a certain confusion of concepts has occurred which may subsequently lead to serious practical inconveniences. This applies especially to the concept of guerrilla-ism. In articles in our newspapers and in speeches this has of late come to be identified usually with absence of discipline, Makhnovism, Grigoryevism, banditry, and so on. And yet guerrilla-ism, which coincides to a considerable extent with the concept of ‘small-scale war’, constitutes (if not as a legitimate offspring, then as a legally-adopted child) an element in official military doctrine. While war, generally speaking, has as its aim the overthrow of the enemy, small-scale war (’guerrilla’) has the task of causing difficulties to the enemy and doing him damage. From the angle of the organising of operations, small-scale war is characterised by a large degree of independence of the separate units. Semi-spontaneous insurgent actions such as we have seen in the Ukraine always include a guerrilla element. But guerrilla-ism by no means always signifies the action of spontaneously-arisen unarmed or poorly armed detachments. Guerrilla warfare can be a method of operation for thoroughly well-formed mobile units which, for all the autonomy they enjoy, are strictly subordinate to an operational headquarters. In fighting now against the Makhnov movement in all its manifestations, including the pseudo-Communist ones, we do not, of course, reject the necessity and expediency of guerrilla activity. On the contrary, we can say with confidence that this will assume increasing importance as the war goes on. Certain critics have frequently charged our method of waging the war with ponderousness, contrasting to this the need for a lighter, more flexible, more mobile strategy, allowing greater independence to separate mobile units. Proceeding, amongst other things, from this notion, Tarasov-Rodionov (see his laughable ‘theses’ in Voyennoye Dyelo) [A. Tarasov-Rodionov, a brigade commander during the civil war, became a writer after 1921. His novel about the Cheka, Chocolate (1922), appeared in an English translation in 1933. He was among the accused in one of the trials of the late 1930s and either died in prison or was executed in 1938.] has argued that it is unnecessary and even harmful to recruit military specialists whose thinking has become petrified in the concepts and practices of positional warfare. Tarasov-Rodionov’s ‘proletarian’ strategy, which is incompatible with the passivity and temporising of positional warfare, calls for mobility, local initiative and impetuousness – counting always on finding fresh sources of supply in the enemy’s rear. Leaving aside for the moment the question of the direction in which our strategy will develop, one cannot refrain from noting at this point that the methods of ‘proletarian’ warfare which, in Tarasov-Rodionov’s view, render the old ‘positional’-minded officers useless for us, are actually neither more nor less than a precise description of the methods and procedures of Dutov, Kaledin, Kornilov, Krasnov and Denikin. It is they who do not maintain a solid front, it is in their armies that great importance is assigned to mobile units, mostly of cavalry, it is precisely the method of guerrilla warfare employed by Shkuro, Pokrovsky and others that consists in feeling for the enemy’s weak spot, so as to avoid his main nucleus, thrusting into his deep rear and finding there fresh sources of supply from the bourgeois and kulak elements of the population. Thus, this strategy, which ‘Communist’ phrasemongers try to legitimise as the new proletarian strategy, considering it to be beyond the brains of Tsarist generals, has in practice been applied, up to now, most widely, persistently and successfully, by none other than those same generals. Experience testifies that ‘small-scale war’ or guerrilla warfare, in the sense of the word defined above, can in certain circumstances be an extremely sharp weapon in the hands of both of the classes contending in a civil war. But when one is proposing, essentially, that we learn guerrilla methods from Kolchak (ski-ers!) or Denikin (cavalry! ), it is silly to chatter at the same time about the ‘positional’ obtuseness of Tsarist generals. ‘Small-scale war,’ guerrilla warfare, as a predominant type of warfare, is the weapon used by a weaker against a stronger adversary. The stronger tries to destroy, to annihilate the weaker. The latter, aware of his weakness, but not giving up the struggle, and evidently expecting that some changes will occur later on, strives in the meantime to weaken and disorganise his stronger enemy. ‘Large-scale war’ (with huge masses, unity of front, centralised leadership, and so on) is aimed at exterminating the enemy. ‘Small-scale war’ (light, mobile units operating with a considerable degree of independence of each other) is aimed at weakening and tiring out the enemy. Dutov, Krasnov and Denikin counted for a long time on getting help from outside. Their task was to hinder the Soviet power, not to let it have any rest, to cut important regions off from it, destroy railway communication with the borderlands, and prevent the development of broad, planned economic work. The natural method of the weaker side was small-scale war. The Soviet power has been all the time, and is still, the stronger side. Its task, to crush the enemy so as to free its hands for socialist construction, has not altered since the day that Soviet power arose. In the first period, when the Russian White Guards’ hopes of aid from Germany, and later from France and Britain, were quite realistic, and when the White Guards con fined their activity, for the time being, to weakening the Soviet centre by blows struck from the borderlands, the Soviet power strove to eradicate without delay its enemies in the borderlands, so as not to allow them to survive until intervention came from outside. Consequently, even in the period of its initial military weakness, the Soviet power sought to form a centralised army and to establish a continuous front, to oppose the disorganising guerrilla raids of the enemy. Thus, it was precisely the political position of the proletariat as the ruling class that led it to adopt the more ponderous forms of military organisation, in contrast to the ‘Tsarist generals’ who, as rebels, focused their experience and ingenuity upon the development and application of mobile, guerrilla, ‘small-scale’ warfare. Looking back at the conquest by the Whites of Siberia and Archangel, and their brief conquest of the Volga towns, or at the enemy’s successes on the Western front, and to a considerable extent also at Denikin’s successes in the South, it is impossible not to see that the principal role in all these operations was played by raids, breakthroughs, and deep turning movements, supplemented by revolts or conspiracies in the rear, or in the Red Army itself – in other words, just those methods which Tarasov-Rodionov puts forward as specifically proletarian, as against the positional methods of the generals. But here it must be said that, the less hope that remained for direct intervention from Europe, and the more seriously that Denikin’s own successes developed, like Kolchak’s earlier, the more noticeable it became that both of them tried to form a more or less continuous front and a centralised administration of large military groupings, that is, to go over from ‘small-scale’ warfare as the main form to ‘large-scale’ warfare, which is merely supplemented by the raids of ‘small-scale’ warfare. What was expressed in this change of strategy on the part of Kolchak and Denikin was that, once they had lost hope of military aid from without, they had to take upon themselves the task of not just weakening but actually destroying the Soviet power with their own forces. This was what necessitated the transition from small-scale to large-scale warfare – the reason for the inevitable downfall of Kolchak and Denikin, since a mass White-Guard army is bound to disintegrate. Well-conducted ‘small-scale’ war imposes on every participant demands that are certainly not lighter than those of ‘large scale’ war but, on the contrary, heavier. I repeat, one must not confuse a rebellion that lacks military experience with guerrilla warfare as such. The revolt of the Ukrainian peasants against the German occupation and Skoropadsky’s rule, or the revolt of the kulaks against the Soviet power, differed profoundly in their methods from the operations of Generals Shkuro and Pokrovsky. In the one case we have groups that rebel in a semi-spontaneous way, quite chaotic, organised and armed somehow or other, and aiming their blows gropingly. In the other case we have properly-organised units, everything well-thought-out down to the last detail, with a big percentage of trained men (officers), with well-adapted equipment and armament, and carrying out well-calculated military operations, free of any element of ‘adventurism’. It is quite clear that what we have here are two profoundly different categories, which cannot simply be fitted into the pattern of ‘generals’ strategy and ‘proletarian’ strategy, as Tarasov-Rodionov wants to present them, but which represent different conditions, different stages in the civil war, and are at different moments a weapon wielded sometimes by one or the other of the contending classes and sometimes by both at the same time. Our Red Army arose from Red Guard detachments and rebel peasant detachments, which only later were brought together for more or less thorough formation in the rear. The Red Guard and peasant detachments were able to achieve successes only in the period of the first stormy revolutionary upsurge of the working masses, when general confusion and dismay reigned among the almost unarmed possessing classes. Unified operational leadership could be given to the Red Guard and rebel detachments only to an extremely limited degree. The operational lines were in fact the lines along which the revolution itself developed. The detachments advanced along the line of least resistance, that is, in the direction in which they encountered the greatest sympathy and co-operation, where it was easiest to stir up revolt by the working masses. In that period the command could not set itself independent operational tasks, and was, in the main, not free to choose the direction of its blows: it could only unify to a certain extent the pressure exerted by the detachments, which advanced almost like the waters of melting glaciers rolling down mountainsides. If we conceive guerrilla warfare as a method of light, swift manoeuvring and sharp thrusts, it is clear that the rebel detachments, through their very primitiveness and the extreme inexperience of their fighters and commanders, were least of all suitable for genuine guerrilla operations. Contrariwise, it was much easier for Denikin, who had at his disposal a large number of regular officers (allegedly forever in the grip of ‘positional’ obtuseness) to form well-constructed mobile detachments capable of carrying out precise and absolutely responsible enterprises of a ‘guerrilla’ character. It would have been the purest nonsense if our central command, hypnotised by the patterns of positional warfare, had not sought from the very start to bring more flexibility and initiative into operations and to accord an adequate place to cavalry raids, but in the initial period all our efforts in that direction came to grief on the inadequacy of trained human material. Guerrilla operations call for very high qualities on the part of commanders – from the leader of the unit down to the senior soldier in one of its sections – and a high level of military training among the rank-and-file. It was just this that we lack ed. Besides which, we hadn’t enough cavalrymen and saddle horses. If we see mobile warfare as the speciality of the working class (which is a one-sided view) and see cavalry as a necessary factor in mobile warfare (which is quite right), we shall have to recognise, not without surprise, that cavalry flourishes most successfully in what are precisely the most backward parts of the country – on the Don, in the area of the Ural-Host,[The Ural Host were the Cossacks of the River Ural (also known as the Yaik), which runs southward from the Ural Mountains into the Caspian Sea.] in the steppes of Siberia, and so on. A whole series of the most outstanding of our foes, such as Kornilov, Dutov, Kaledin, Krasnov are or were cavalrymen. . . The shortage of cavalry, an arm most difficult to train, obliged our command to try to create a mounted infantry that would be capable of mobile warfare, but owing to the low level of the infantry units and the shortage of saddle-horses, this task was not accomplished, either, during the first period of the civil war. Newcomers to Marxism are trying to deduce from the aggressive psychology of the proletariat, in one breath, its military organisation and its class strategy. In doing so, alas, they fail to notice the fact that to the aggressive character of a class there does not always correspond a sufficient number of ... cavalry horses. 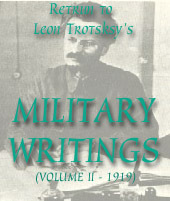 From all that has been said, a conclusion follows which is the opposite of that drawn by Tarasov-Rodionov: the low level of military training and education among the Red Guards and the rebel masses, and later among the conscripts, the extreme shortage of commanders who were both qualified militarily and wholly devoted to the revolution, and the almost complete lack of cavalry naturally forced the Soviet power to adopt a ‘mass’ strategy and a continuous front, with features of positional warfare – which was, at the beginning, highly unstable. Contrariwise, distrust of worker and peasant manpower, an abundance of experienced, White-Guard-minded commanders, and a comparatively plentiful supply of cavalry impelled the military leaders of the counter-revolution to take the road of light, mobile detachments and well-calculated guerrilla ‘ventures’. But, as has been mentioned, it would be theoretically imprudent to assign these two types of warfare to the contending classes, merely changing the addresses. In fact, we observe changes in both types. Having won certain successes, the White-Guard generals are proceeding to conscript the peasants and even the workers and to form a numerically-imposing army – which will, naturally, lack mobility and .manoeuvrability. Alongside these ponderous ‘positional’ armies, the White Guards are forming special units or corps endowed with a considerable degree of operational independence. On the other side, the Red Army, too, in the process of many months of intense struggle on various fronts, with a great variety of natural conditions and operational situations, has trained within itself a number of excellent units with seasoned and enterprising commanders. The efforts of the first period to create guerrilla detachments resulted only ... in laying down an establishment for a manoeuvring battalion, but they did not produce mobile detachments really competent to perform guerrilla tasks. We now possess all the prerequisites for such detachments, although even now we are having to overcome substantial difficulties in creating a cavalry force. These difficulties will get fewer the further we penetrate into the Oren burg steppes and the faster we advance into the Don country. Introducing greater mobility and initiative into the fighting activity of the Red Army is now much more feasible than was the case a year or six months ago. But in this sphere we are in need, to a considerable extent, of learning precisely from the ‘Tsarist generals’, and, moreover, from those who are fighting on the other side of the barricade. In conclusion, it can be said that, as a result of protracted civil war, the military methods of both camps are drawing closer together. While we are now giving very close attention to the creation of cavalry, the enemy, who long since followed our example by carrying out mass conscription, has begun to form his own political departments, agitational centres and agitational trains. We observed the same rapprochement in the methods and procedures of both camps in the imperialist war, as well. When they fight one another for a long time, enemies come to learn from each other: they scrap what in their practice has proved useless and master what they were at first lacking in. But without in the least belittling the importance of technique, organisation or operational leadership (in all these spheres, as I have said, a certain equalisation is taking place), we can say with complete confidence that, in the last analysis, the outcome of the struggle will be decided by whose ‘agitational centres’ prove to be the stronger, that is, by whose idea proves the more convincing for the masses of the people and capable of uniting them in that spiritual bond without which no army can exist. But on that matter there is no room for doubt. Along our front moves the train named after Lenin, Comrade Kalinin’s train; [Kalinin travelled along the Southern front in an ‘agit-prop’ train. V.M. Purishkevich, an extreme reactionary politician of the Tsarist period, was with the White forces in the South at this time, editing a newspaper in Rostovon-Don.] along theirs moves the train of ... Purishkevich. The outcome of the struggle is predetermined. All that is left is to hasten the victory, by not departing from the road taken, by not getting caught up in pseudo-proletarian doctrinairism, but learning from life in whatever form it appears, even in the form of ‘enterprising’ Tsarist generals. * Romodan is the junction of the Gomel-Kremenchug and Kiev-Poltava lines. 27. The civil war in North America lasted four years from 1861 to 1865. Problems concerned with a general contradiction between economic interests and emancipation of slaves led to an armed conflict between the aristocratic landowners of the South and the industrialists of the North. The presence of a cadre of commanders and of masses who were accustomed to bearing the burdens of war gave great advantages to the conservative South. The North, with a predominantly urban population (which, to be sure, was larger than that of the South) and a complete lack of commanders, had at first to suffer a number of defeats. In the end, the Northerners won.